Pope Francis said: “The world is at war”, and he made clear he does not side political leaders having in mind what they frame as war on terrorism, not to speak of a religious war: “It’s a war of interests, a war for money. A war for natural resources and for the dominion of peoples“, he said (quoted in Inés San Martín, Pope Francis says the world is at war, but not a war of religions, in: cruxnow, 27 July 2016). By that statement the pope unveils the ultimate cause of the global crisis we are facing – a cause that cannot be fought by pouring money in military measures and strengthening safety and security for one’s own homeland at the expense of the freedom of the citizens. Actually, all that has proven counterproductive. It led us deeper into the war the pope is pointing at. One of the best analyses i ever read of terrorism in that context can be found on telepolis in german: Zwischenruf eines Blauäugigen, an article by a former judge at the bavarian administrative court of justice, Peter Vonnahme. Have a look. 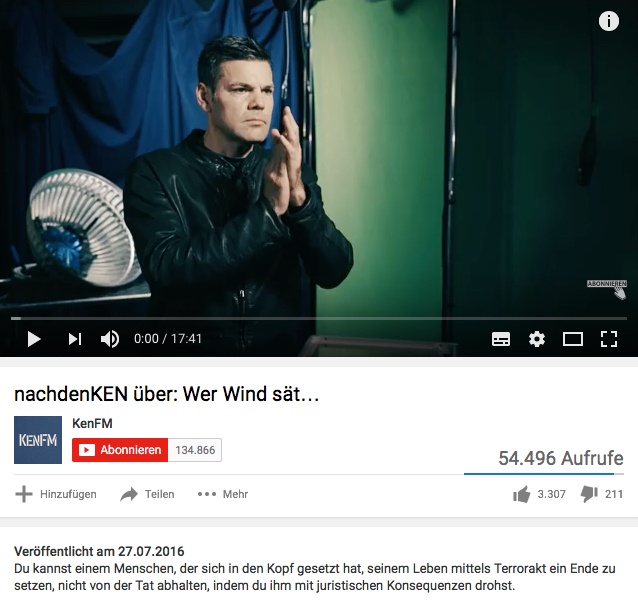 An emotional appeal for reflecting upon the causes of the terrorist attacks in the west is here: Wer Wind sät… (after the book of Michael Lüders on western foreign policy in the orient), a video by KenFM (in german too).